March BASH-NESS 2016 – LETS DO THIS « Big Squid RC – RC Car and Truck News, Reviews, Videos, and More! It’s the near the end of March, and you know what that means right? It’s the time when our readers tell us who they think is the current king of rc in the world! 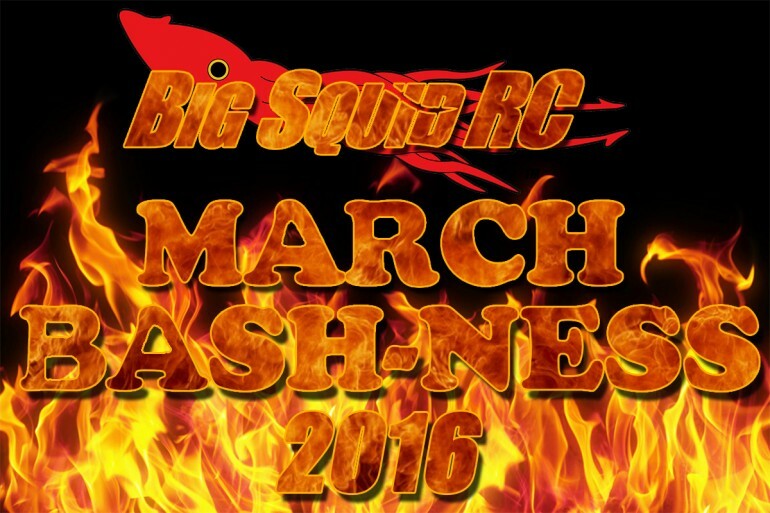 It’s Big Squid RC’s 6th Annual March Bash-ness. For the Big Squid RC Newbies, March Bash-ness is our annual Reader’s Choice event where you, the readers, the best fans on earth, get your say in which RC vehicle is the greatest bash vehicle ever. That’s right, ever. Not just what was released in the last six months or year. Not just which one was put on the ballot because a particular company paid to be there (like most other readers choice awards) It’s all you. You nominate the contestants, you vote in a head-to-head battle between models, you determine who makes it to the next rounds, and who is eventually crowned king. This is the Selection round. Use the comments section below to nominate your best bash vehicles of all time. No need to limit yourself to one vehicle or one released in the last year or even specific categories. Nominate as many as you’d like of any type from any period in RC history. In two days, we’ll close the selection round, pick the 16 most nominated vehicles out of all of the nominations and then the competition will begin. For those that do not want to use Facebook to comment, you can also use our contest give away form below. So which car or truck will join the previous kings of March Bash-ness? Which can compare to the previous winners like the Savage Flux HP, Losi 5IVE-T, the ARRMA Kraton? Which vehicle will we be giving away when it’s over? That’s right, as tradition goes, when March Bash-ness ends, we give the winning vehicle away to one lucky reader. We need a bunch of people to send in nominations so we can the build starting bracket. Tell your friends, tell your family, share, like, tweet, whatever, help us get the word out that March-Bashness has started! Because we appreciate you all so much, how about we give something away just for helping spread the word and create the bracket? TWO random people will win a Big Squid RC T-Shirts! Awesome right? Just nominate some vehicles, spread the word, and you have a chance to win! P.S. Please no flame wars in the comments. Keep it civil or get banned from the giveaway.